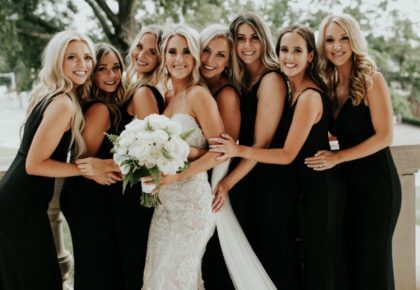 We’re still on cloud nine over last week’s exciting cover reveal, and we’ve been anxiously waiting to show you more from Rylan and Trevor’s rustic Oklahoma wedding at Rosemary Ridge in Stillwater. 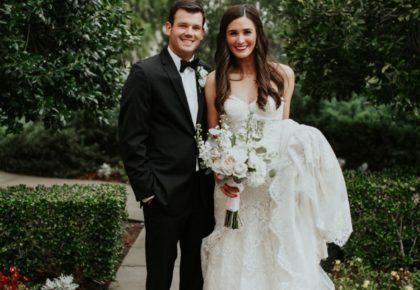 Rylan was absolutely stunning in a Cambie by Truvelle gown featuring an ethereal flowing chiffon skirt and illusion V-neck, lace bodice from Chantilly Couture. The talented team at Atherial Beauty added the finishing touch with subtle makeup and a soft updo to perfect Rylan’s natural bridal look. 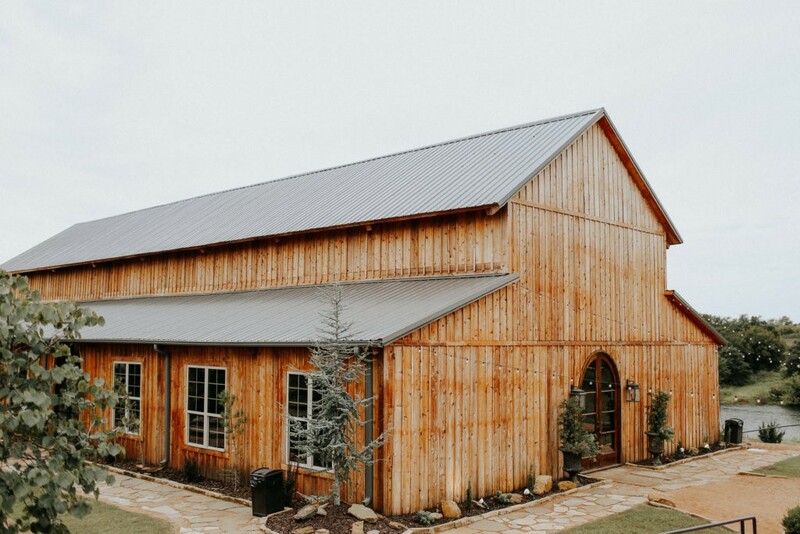 The sweet celebration featured lots of greenery and wood textures with rentals from Marianne’s Special Event Solutions and Party Pro Rents that perfectly complemented the rustic barn venue. Ever Something designed elegant earthy floral arrangements in hues of cream and gray with pops of burgundy. The delicious cake from The Round House Bakery was carrot cake with cream cheese frosting and vanilla with buttercream, and cutting it was one of the couple’s favorite parts of the day. 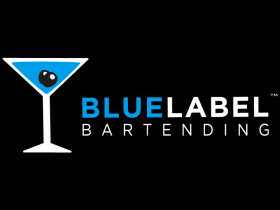 Blue Label Bartending crafted scrumptious cocktails and guests danced well into the night until it was time for the dazzling sparkler exit. 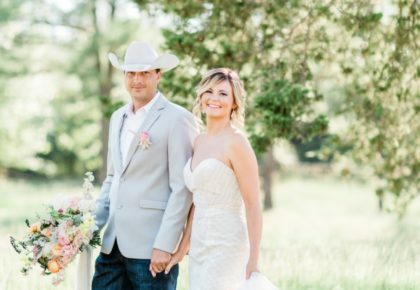 Rylan and Trevor love to revisit their perfect day through the timeless photos captured by Peyton Rainey Photography and the emotional video by Redeemed Productions. 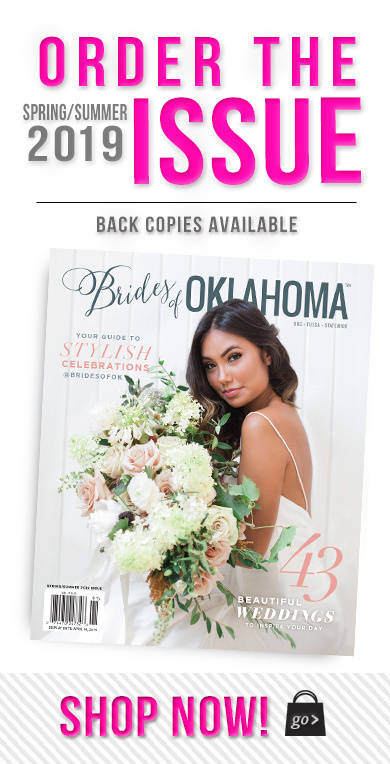 Catch Rylan and Trevor’s rustic Oklahoma wedding in the brand new issue on pages A1-3 — alongside dozens of other fabulous Oklahoma weddings, and be one of the first to get your hands on the Spring/Summer 2018 issue by ordering today. Cheers!